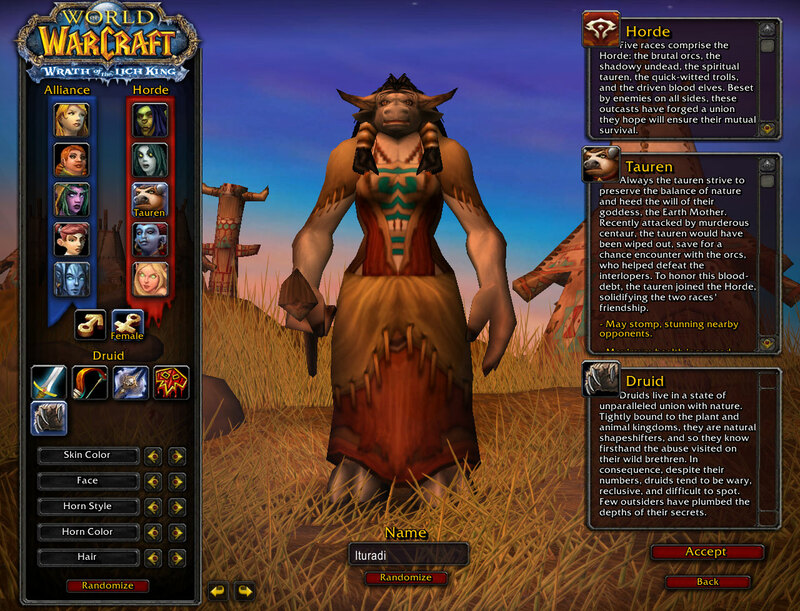 Blizzard has a done a lot throughout the years to improve the look and feel of the game. They’ve incorporated lots of addons into the core game, and it’s almost a whole new feeling compared to the ‘original’. But you know what they haven’t done anything with? 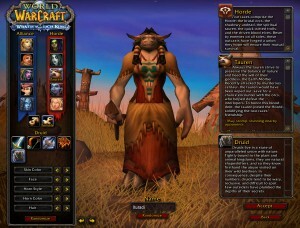 The character management screens. The screen you see when you’re selecting your character, or creating a new one. They could really use some sprucing up, and I have a few ideas I’d like to suggest! I don’t need to have Auctioneer or Quest Helper running when I’m going to a raid, and I don’t need Omen or Recount when I’m leveling an alt or soloing. But it’s too much trouble, and too easy to forget to check/uncheck those little boxes before each time I log in. I’d like to say “Switch me to Raiding mode!” and off I go. 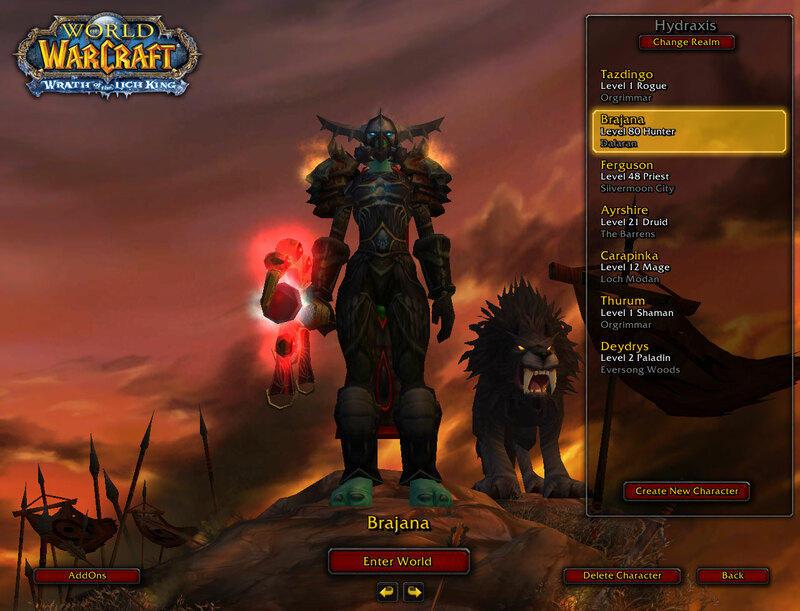 Character List Sorting: When I switch my characters over to my new account, I created my new bank alt before transferring Brajana. Now and forever more, my bank alt is first on my list of characters. I’d like to be able to manually switch the order they are displayed, or at least sort them by level or something. Check Name: I’d like to just check if a name is available. I don’t want to have to create a character and delete it every time I find an available name. Just a little button beside the name field would do, thanks. More camera views: Right now, you can only spin the model of the character you’re creating. What if you want to know what it will look like from another angle? What about if you want to zoom in and see it close up? Sorry, you can’t do that here. Well, that isn’t too difficult, is it? Just a few little changes and the front-end of the game will be as up-to-date as the rest. Get on it, Blizz! How to QQ: A Fill-in-the-blanks Guide! There’s a good reason I don’t often visit the official forums. The whining can be quite overwhelming sometimes. And usually, it’s not very original. However, I do appreciate all the hard work the QQers put into each and every post. So, if you are one of those who likes to spend time on the forums “expressing yourself”, I’ve created a template to help you more efficiently spout your nonsense, improving your QQPS! Simply fill in the underlined fields with your current grievance, and off you go. Feel free to add your own style by removing punctuation and adding spelling errors and caps lock! I can’t believe the change they made to (class/profession) in (upcoming patch)! First they take away (mechanic/talent/spell/recipe) and now this?! Meanwhile, (some other class/profession) gets a buff pretty much every patch. I can’t even keep track of the vagaries of Blizzard, each patch is so full of random changes no one wants or expects. If the devs even play this game, obviously they are all playing (some other class/profession) because they are always getting the best stuff while us (class/profession) get nothing but crap and nerfs. I know for a fact that Ghostcrawler said we would get (better itemization/new talents/new bonuses/buffed/a pony) this time, so he really needs to get fired because he’s full of it! I am sick of Blizzard always catering to the (arenas/PvEers/hardcores/casuals). No one cares!! If you don’t (raid/do arenas/have a life/raid all the time) then this game is not for you and you should just (GTFO/DIAF). If this change seriously makes it off the PTR I am quitting this game and never coming back, because (class/profession) will be SO BROKEN. Thanks to my lightning F5 fingers, I didn’t even see the queue, I went straight in. Two tickets purchased, attendee info filled out… we’re going to Blizzcon! There’s still another day for those who didn’t successfully get tickets this time… some of the people I’m looking forward to seeing haven’t been able to get through, I sure hope they do next time! At least the system is working a lot better than last year!